You are all welcome here my dear special NYSC 2018 batch C Stream II. I am Lola, your special NYSC Google assistant and i am here to make everything about NYSC easier and look less complicated. You can ask me any questions you have, no matter how many of them, no matter how funny or simple it sounds, no matter how complicated or long it is, all you need to do is ask Lola and you will be surprised at the speed of light I will use to attend to your questions. Even questions I don’t have an answer to, I have a lot of friends in the system I can phone. You don’t have to feel bad because you are not with Stream I. Am sure nobody is even feeling bad about that. Because going with stream I does not mean anything. The only difference is that they get to go camping before you. The NYSC 2018 Batch C Stream II registration is what I want to briefly talk about because I want you to get the first-hand information about it. I am going to be sincere with you guys by telling you all that we are not 100% sure that there will be another registration for stream II. Am aware that some schools uploaded their Senate list very late, I know some Prospective corps members are still having issues with their names on Jamb matriculation lists and other issues that are not allowing them to register. I am aware of all those issues. However, the fact remains that as am talking to you, nobody is sure either there will be another registration or not. The several officials have put a call to are saying there is no official information about that yet. Anything might change as time goes on, but for now, there is no assurance if there will be registration or not. Something like this happened early this year when the NYSC managements noticed that there are more people on the ground and they had to open the NYSC portal for another registration. Something like that might happen, but we are not sure about that. The NYSC 2018 Batch C Stream II Call-up letter is that piece of document that will tell you the sate you have been deployed to. Also on answering the exact date it will be out, I will have to disappoint you because there is no official date yet. If I give you a date now, it will only be a wild guess which will be bad for your health (smiles). The closer I can be is to tell you that it will be after NYSC 2018 Batch C Stream I camp because all the ICT and energy will be focusing on the orientation camp. You don’t have to worry because we are all together in this and am going to stay here with you till you will become a full NYSC gallant Corper and not a Prospective Corps members. When your village people see you, they will shout! Corper Shun!!!!…. Baba Corper Shun!!!!! Mama Corper. Ajuwaya Papa!!!….. If you are not laughing by now, maybe you are still angry you are not with stream I or maybe am not just funny. lol. So about you Call-Up letter, there is no date yet. You can keep coming here or connect with other PCMs I will drop a link below. The date we have been speculating and which is going around is 3 days after the Stream I orientation camp. Although the authenticity of the date is shaking because 3 days after stream I camp might be too stressful to start another camp. But hey! anything is possible and for the fact that it has never happened before does not mean it won’t happen. 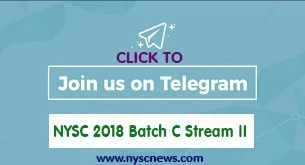 The First and only thing you should do right now is JOIN THIS ACTIVE NYSC 2018 BATCH C STREAM II Telegram group. Our WhatsApp groups are filled up because of the limited numbers of group members. Why scatter ourselves when we can all be in one place to connect, hang out and get first-hand information and instant answers and help. One more thing you should do is share this post so that all NYSC 2018 batch c Stream II can get this information. Sharing is caring. Pls, if there will be stream 2 can NYSC still allow some schools to upload their senate list? Please, what of those who are yet to be evaluated..? LOla’ please can u clearify us on tis issue of registration continues from 24oct-5nov’ what abt those that have not seen their name on senate list.. what am trying to ask is,if the date above is for mobilization against stream2 pending registration by PCMs..
we have to hope that your school will upload by then. What are they waiting for self? Please, what can i do? On my dashboard it is written present your nd result for registration. How can we connect with you on hang out? Pls wat abt those dat hv no admission letter yet.will they be allowed to register. sent a message to upload my Original WAEC certificate, I did that. couldn’t delete it. after uploading, I wasn’t evaluated yet. will I be evaluated? and what should I do. wait for the response of evaluation… If you will have to re-upload, NYSC will notify you. Pls there was a mistaken on my date of birth and i already commenced the batch a 2019 nysc registration but I didn’t proceed after seeing that there was a mistake on my d.o.b, pls what can I do to make it with this batch B? Correct the mistake…. Where is the make from? School, Jamb, WAEC?